Beating Japanese Beetles | Gardens Alive! Question. Mike: I am being overrun; I used Sevin; they laughed at it. I mixed it stronger; they laughed louder. I have dogs and am not comfortable spraying insecticides all the time. I have a horrendous invasion on my crepe myrtle, birches, apple and cherry trees. Do you have any long-term solutions? The birds could have a FEAST if only they ate them! Could you please share any info on those nasty bugs? I'm sure my neighbors get a big laugh every time they see me try to put a new 'bag-a-bug' bag on the stand. Several years ago they suddenly appeared, destroying a cherry and peach tree and decimating my apples. The next year I lost my entire crop. This year I notice that some are a little bigger and have a red sheen;are these mutants? Do you have a solution short of a nuclear blast? We just planted a Crepe Myrtle bush; immediately Japanese beetles were all over it. We spray and they just come back. Is there a good natural way to control these pests? Thanks. Answer. I cast an especially wide geographic net for this week's questioners so that you folks leaning in real close right now would know you weren't the only ones being defoliated by these pests. Hand picking can be very effective.Get around their 'drop and roll' defense by snagging them early in the morning when they're slow and sluggish. Place a pan with some soapy water in the bottom below the infested area, reach for the beetles from above, so they can't fly away, and they'll drop right down into the water. 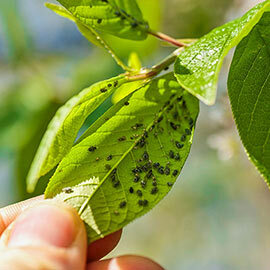 Smother the beasts with a spray of good old insecticidal soap. Just be sure to spray the beetles, not the plants; soap sprays have to coat the bug to be effective. Plug a vacuum cleaner (preferably a shop vac) into the nearest grounded outlet and hose the little nasties up like they was dust bunnies under a couch. Make beetle-repelling "bug juice" with your catch! Whiz a handful of the sucked-up beasts in an old garage-sale blender with a pint of water (this alone should make you feel much better! 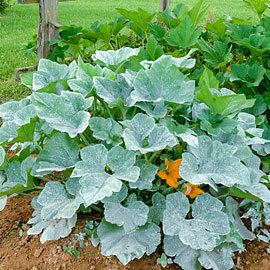 ), strain the resulting slurry and spray it on your plants. Old time farmers swear that pests won't go near plants that have been sprayed with the remains of their relatives. If you're a wuss (or only have one blender), try making a more congenial repellent by whizzing up two cloves of garlic and a hot pepper in that pint of water instead of the pests. Strain, add a drop each of dish washing soap and vegetable oil (or better still, insecticidal soap and horticultural oil), and spray it on the plants under attack early in the morning. Or cut to the chase and soak plants under attack with one of those commercially available garlic sprays designed to deter mosquitoes; see last week's Q (xarticle.asp?ai=572) for all the details. It should work even better than a home-made spray,AND the area will be free of biting bugs for a couple of weeks as a bonus! 7. If nothing less than an insecticide will suit you, make it a non-chemical, non-toxic one. The natural product Neem—derived from an Indian tree—should kill any beetles it hits and act as a 'feeding deterrent' to repel future attackers. 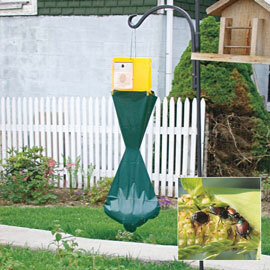 Luckily, Cathy in Delaware is wrong—birds DO eat Japanese beetles. So create a beetle buffet by placing birdbaths, feeders and nesting boxes near the plants under attack. And don't chase away starlings! These so-called 'pest' birds feed on both the adults AND their grub-babies in your lawn! Fruit trees and grape vines can be protected from beetles (and the many other pests they attract) with a clay-based insect barrier, like Garden's Alive's "Surround at Home". These sprays coat the plant with a thin gray film that repels both insects and disease, and smothers any pests you actually hit with the spray! 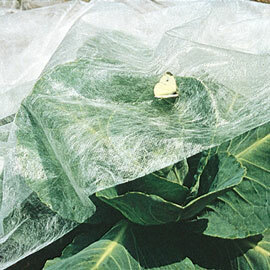 Traps do catch lots of beetles(and yes, the sight of that wriggling bag filled with defeated defoliators is very satisfying), but they also have the potential to greatly INCREASE beetle damage. That's because the lures attract about four times as many beetles as would otherwise try and ravage your roses, but about half of the pests bounce off and escape the bag,effectively doubling your beetle battle. Experts say they work best when used as a perimeter control, positioned on the furthest outskirts of your property, far away from the plants under attack. And finally, insect problems are always worse in non-organic gardens,where the balance of nature is out of whack. Chemical fertilizers cause lush, weak growth that brings in pests by the droves. And, as many listeners wrote when telling us about their beetle woes, toxic chemical pesticides like Sevin don't work well to control these (and other) pests, but are excellent at killing and driving off beneficial insects, birds and other predators that DO—not to mention limiting your happy and healthy lifespan on the planet.